A few months ago I came back from my friend’s Hen Party in Berlin and fell really ill for about two weeks. I think it may possibly have been a strain of Swine Flu, or, at the very least, a pretty bad case of the flu. I completely lost my appetite, felt nauseous all the time, was running a high temperature, didn’t eat for a week and lost about a stone. To make things worse, my mom had to go to Hong Kong for a few days, which meant that I was looking after myself at home. Thankfully, my lovely boyfriend had a few days off from work and came over to help look after me (and, of course, then got ill as well, but for those few days he was awesome!) and force some food down me. This was one of the dishes that he made me towards the end of the week when I could actually eat again (he also made me chicken noodle soup from scratch and the world’s most onion-y omelette: yay antioxidants!) and I’m not sure if it’s because I started getting better so I associate this dish with good memories, or because it was just so darn tasty, but I’ve been a little obsessed with it ever since. However, being me, I have bastardised it a little from David’s version, but I think it’s the kind of recipe where you can make it your own. I’m going to give you David’s version, which, incidentally he learnt from his dad, who was trying to recreate something he had in an Italian restaurant in New Zealand, but I’ll also tell you what I substituted. It’s a super quick meal to throw together and it also tastes amazing. 1. Put a pot of water on to boil, add a glug of vegetable oil and your pinch of salt. When the water’s boiled add the pappardelle and cook until al dente. Drain and set aside. 2. Meanwhile, saute the mushrooms, ham and chilli in the butter, add the cream and let reduce. If you’re like David you can do this at the same time, so that you can throw it all together. If you’re like me and want to reduce the amount of washing up you have to do at the end, you can wait until your pasta’s draining and then use the same saucepan to make the sauce! 3. Add the pappardelle into the sauce, give it a good toss through, then take off the heat and add the avocado. Toss again, then place on warmed plates and top with parmesan cheese. 4. Get stuck in and obsess over this dish until you have it coming out of your ears. So a few substitutions I make: using double cream all the time is delicious but incredibly indulgent. I tend to use about a tablespoon of cream cheese instead, which I can then thin out a little with a little reserved pasta water. You can also use single cream, but then, to thicken it, add about a teaspoon of cornstarch, dissolved in a little water. I also like to throw half a large red onion in there (chopped roughly into large-ish squares/cubes, of course), sauteed with the mushrooms in the butter before adding the ham. Super tasty, quick and easy. Try it out! Have quite a few recipes I’m working on over the next couple of weeks, so expect a few more posts from me. Until next time, folks – peace and love. 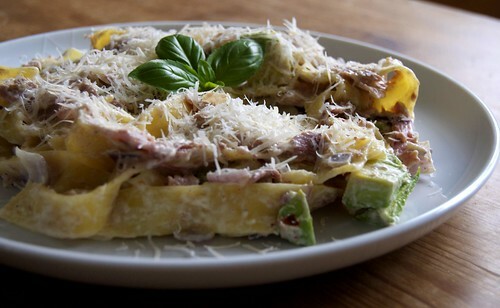 I have never tries pasta with avocado, this is surprising….yours looks tasty ! That's so nice. It's a good boyfriend. Keep him as long as you can! Magdalena – it is a bit of a random thing to throw in, but it goes so well. Another one to try is a bit of pear (the hard variety) – the sweetness it gives to the dish is really great! Sautee it with the onions.